READY FOR A MOBILITY SCOOTER? Drive Medical has the perfect scooter—or power wheelchair—to fit your needs. 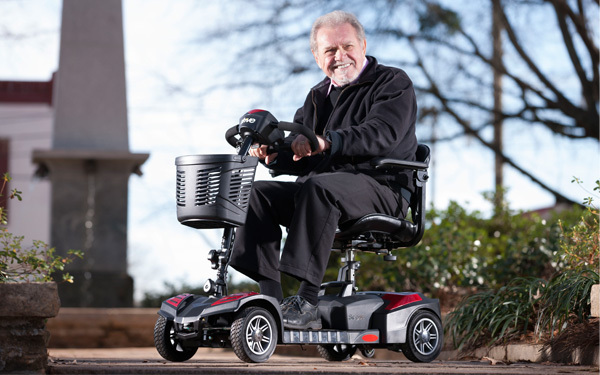 And, if you are a Medicare, Medicaid or private insurance subscriber, you may qualify for one of our power mobility product at little or no cost to you! For more information, or to take a test drive and experience the freedom a power mobility product can offer, sign up today! It lets you shop at the store, dine out with friends and keep up with your family. In short, mobility is independence. So when your mobility is limited, it keeps you from experiencing life the way you want to live it. If you are finding it harder and harder to get around and need occasional or part-time mobility assistance to perform your daily activities, a scooter might be the right solution for you. Mobility scooters—sometimes called POVs (Power Operated Vehicles)—are mobility devices that are similar to power wheelchairs but have the appearance of a motor scooter. Scooters are operated via a control panel with bicycle-like handlebars mounted atop a tall post called a tiller. Steering via a tiller does require some upper body strength, so keep that in mind when deciding if a scooter is right for you. Also, even the smallest scooters require more room to maneuver than a power wheelchair.